How many of you here are looking for some real talk? I mean, real talk? I have never done this before. Whether out of fear, shame, defeat or laziness—I just haven't done it. But today is the day. First, HAPPY OCTOBER! October is probably my favorite month of the year. I LOVE fall. Seriously. And october is the epitome of fall. The leaves change, the weather changes, I love it! And this October, I am setting some pretty lofty goals. And, just like the leaves change and the trees drop their [dead] remnants, so too I will change, evolve and walk away from the dead luggage my business is carrying. Quite the build up, aye? Beyond all of that, I also want to take a moment and just be real. I started McAlpin Creative (officially) on August 16, 2015. In case you don't feel like doing the math, that was 46 days ago. Since then I have been on a roller coaster. Building my brand, launching my website, working with my first few [official] clients—it has been crazy, exciting, fulfilling and absolutely wonderful. 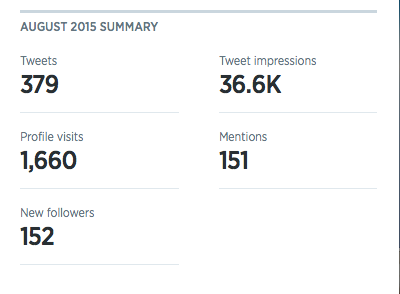 So, what have the last 46 days looked like? So, here we are. I am thrilled with the last 46 days, but I have big dreams. I don't want to lose any traction moving into October. Without further ado, here are my goals for October! Yes. That's right. I want to double my list this month—and here's how! I am going to be testing a few conversion tactics on my site to try to engage + convert more of my visitors including sprucing up my welcome mat + adding a lead page or two! Get your hands on awesome freebies, advice and more! Traffic: I'd be ok with no change, as long as it's valuable! My traffic goal is not numeric. 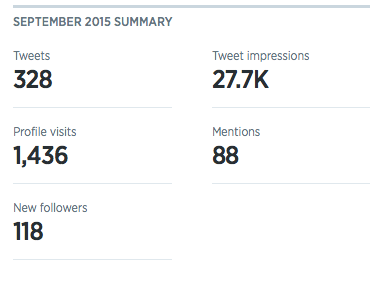 I just want to consistently see engagement and visitors on my site! I think this goes hand in hand with my community goal! I recently helped a client increase her Facebook engagement pretty considerably—but I have been scared to do it myself! How ridiculous is that?! I guess I am afraid that if I try and fail, I'm full of sh*t. There. I said it. But, it did work for my client. So I know I am being crazy. 1 out of 2 wouldn't be THAT bad...LOL. Twitter: Is 500 followers too lofty? That would be my largest growth yet. I have been averaging just over +100 each month since the business launched (so August + September), and 500 would be 120.. I am nervous setting this goal, but I want it! I LOVE my Twitter community. So yes, I want to grow it! Pinterest: I want to engage more here! I have not put much into Pinterest, but I want to! This month I want to spend at least 15 minutes a day pinning away! Can I be real? I'm not even sure what to make my goal here. I LOVE Bloglovin'. In fact, it is all I use to fill my buffer and follow my favorite influencers. But I haven't figured out how to maximize my exposure. So maybe that is my goal? Last goal? Produce an income + investment report for October. It is with anxiety that I say this—those are my goals. Yes, I want to gain more clients, make more money, sustain myself and justify my investment. But I am most concerned with establishing my brand correctly. I know how valuable this time is. What about you? What are your goals for October? Let me know below!